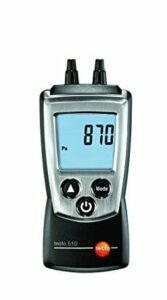 Our pick for the best digital manometer? The Testo 510 wins hands down. Welcome to our guide to the best digital gas manometer. Below we’ve included detailed information on the manometer we think is the best all-rounder. If you’re looking to run tightness/let-by tests, you’re going to need a digital manometer. You could use a u-tube manometer. But, if you want higher accuracy and ease of use, then a digital manometer is what you need. Unlike other gas testing products, the manual (u-tube) version isn’t actually much cheaper than the digital manometers on the market today. Gas tests should only be completed by Gas Safe accredited engineers. If you are not part of Gas Safe, you need to call someone that is, to complete tests for you. It’s rare that a gas testing “top” list is going to be complete, without featuring Testo. And that’s just one of the reasons we’re picking the Testo 510 digital gas manometer. Unlike boiler filters and heating inhibitor, gas testing products like manometers and flue gas analysers are slightly more niche. That means merchants won’t stock all brands supplying digital manometers, so it’s hard to determine which ones are the best. Testo have been producing testing equipment since 1957. Sure, there are plenty of other quality brands on the market. But, there are very few that have stood the test of time like Testo have. Companies don’t survive for 50 years+ and grow to 250m EURO turnover by producing products that don’t work. So, with that out of the way, let’s get a quick overview of the Testo 510. It’s a digital manometer that you’ll be able to use for testing pressure differentials in not just heating systems, but air conditioning as well. Using the 510, you’ll be able to test anything from 0 to 100 mbar easily, and that’s going to make this suitable for domestic and commercial testing. 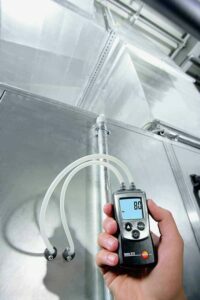 If you’ve ever used Testo flue gas analysers, you’ll know that operating them is a breeze. Their menus are much simpler in comparison to other analysers in the same price bracket. And the same goes for the Testo 510 digital manometer. You’ll be able to flick between testing different measurements quickly. The list of measurements you’ll be able to take? You’ve got everything you need to complete gas tightness tests at your finger tips. For air conditioning engineers, there’s also an additional extra in the form of a Pitot tube. That’s going to allow you to measure ventilation duct flow from 10 to 100 m/s. Now, most of us choose a digital manometer over a u-tube simply due to ease. But, accuracy is definitely more important. And, that’s what you’re going to get by using the Testo 510 over a u-tube manometer. The 510 takes into account both air density and temperature. That’s going to mean that your readings aren’t affected by current conditions, so your readings are spot-on. The 510 gas manometer is tiny. It’s 119 x 46 x 25 mm. Being so small means it weighs a stupidly low 90g. But, compact digital manometers some times come at a price; functionality. You can’t cram tech much into a small space, can you? Well, Testo have managed to do just that by simplifying both the display and button format on the front casing. You’ll be able to operate the 510 using just three buttons. And, if your still working with an old school u-tube, you won’t have one thing; your hands free to do some graft. The Testo 510 (like their gas analysers) has built-in magnets. So, clip it somewhere near to what your measuring and you won’t trip over it, or have to fumble around with it in your hands while trying to take measurements. We’d all like to work outside, or at least in the light. Unfortunately, there’s a good chance the gas test your doing is in a tiny cupboard somewhere, and that’s going to mean poor lighting. The Testo manometer has you covered here too. There’s a backlit display so it’s easy to see in bright sunlight, but in low light as well. OK, so we don’t all look after our tools the way we should. And, electronic devices aren’t exactly known for their durability. Testo has protected the 510 digital manometer with protective cap. But, there’s also other precautions in place to stop you dropping it. These include a belt pouch and wrist strap. If you’re making an investment, you might as well protect it. Compared with competitors, the Testo 510 digital manometer is cheap. But of course, there are always cheaper products out there on offer from “no-name” brands. When testing gas, either use a cheaper u-tube from a reliable brand, or invest the cash in a digital manometer from a brand you know and trust. The 510 is literally ready-to-go off the shelf. It’s not like the cheap equivalents that don’t come ready to use (i.e. you might as well have just invested in a full manometer kit to start with). Who Should Buy This Digital Manometer? There are digital manometers that are 2x the price but offering similar technical specs as the 510. And, it’s not like Testo are a cheap “no-name” brand. They’re one of the best when it comes to gas testing equipment. If you’re a gas engineer looking for a reliable digital manometer, the Testo 510 is a great option. 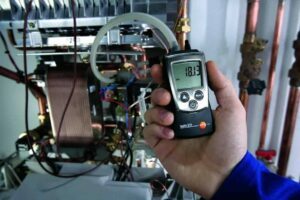 You can get more information on the Testo 510 here, and find a place to buy, by clicking on the “store locator” at the top of their website. Thanks for reading our 5-minute review of the best digital gas manometer. Purchased a digital manometer that you’re happy/not happy with? We’d love to know which one and what you think about it. Drop and comment below and we’ll get back to you as soon as possible.